MINDOUROU, Cameroon, Dec 30 2013 (IPS) - Essomba Dominique, a Baka man from Mindourou in Cameroon’s East Region, sits dulled-eyed in front of his hut, known in the Baka language as the ‘mongoulou’. A wood-transporting truck rumbles by, raising billows of dust in its wake. As he watches his seven children play in the courtyard, Essomba’s mind seems consumed with questions about their future. “These passing trucks mean these children are going to suffer,” he tells IPS. As if to illustrate his point, Essomba grasps his spear and whistles to a nearby dog. The animal wags its tail obediently and follows its master into the surrounding forest. After three hours of hunting, Essomba comes back, with just one miserable monkey strung on his shoulder. In the distance, sawmills are busy, and bulldozers as well, opening up access roads to logging and mining sites. “Just look at the way they are destroying this forest,” Essomba says. For the Baka, the forest represents the beginning and the end of life. All this has come under threat as Cameroon gets closer to living its dream of becoming an emerging economy by 2035. The Baka are allowed to hunt in secondary forests, “but that precisely is where timber companies are also allowed free rein to log, and that’s destroying the forests,” Ndobe says. He regrets that the fauna-rich parts of the forests where the Baka used to hunt game have now been protected and guarded. 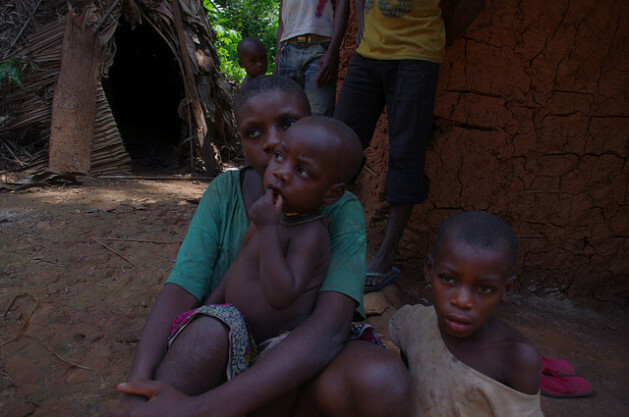 “Logging areas are also guarded, and the Pygmies are now found on the fringes,” he says. Conservation groups have been working with the government to find middle ground between conservation efforts, the rights of the Bakas and the exigencies of development. One way of integrating the Baka in the development agenda is through education. The World Wide Fund for Nature (WWF) is working with the government to develop educational strategies. The challenge is getting the Baka into formal school settings while at the same time safeguarding their culture. “The Baka have strong cultural ties to the forest, and an incredible traditional education: as they grow up, young children learn the nutritional, medicinal, and spiritual qualities of the plants and animals all around them,” Sarah Tucker, senior international consultant for WWF, tells IPS. “Innovative education approaches must engage Baka children and communities in a way that welcomes their culture. School must enable them to build skills necessary to flourish in their forest home as well as in the outside world,” she says. Xenophobic tendencies among Bantu neighbours also keep the Bakas on the fringes. “Bantu consider Baka as sub-human. They claim Baka kids stink in class,” Alexis Tadokem, head teacher of a government primary school in Ntam Carrefour, a village on Cameroon’s borders with Congo Brazzaville, tells IPS. “Baka are used as servants to Bantu. They are tortured and sometimes killed in the forest by the Bantu,” he says. “When our children go to school, they are beaten by the Bantus,” confirms Yana Nicolas, a Baka man in Moloundou. These constraints have been worsened by the influx of logging and mining companies, as well as the creation of national parks which limit Baka access to the forests they have traditionally considered their natural home. A research team from the WWF has issued a series of innovative proposals, including adapting the educational calendar to the seasonal movement of Baka, use of the Baka language as co-medium for teaching in school, involving the Baka community in the educational process, and streamlining the content of education programmes to the socio-cultural context of Baka. “We believe these innovations could help restore the eroding dignity of the Baka, and enhance Cameroon’s drive towards attaining the millennium development goal on universal access to primary education,” Zame Obame, pedagogic inspector in charge of nursery and orimary education at the ministry of basic education, tells IPS.